Testing unreleased games is both fascinating and mind-numbingly boring. It's a strange contradiction. Testers get a chance to see the development process unfold as new builds arrive fresh from the programmers. They are in a unique position to watch new games being built piece by piece, as bugs are fixed and new components added. If you've ever wanted to see a game evolve, testing is a good way to do it. For some, it's the ultimate dream job. Many aspiring game developers see testing as a way to get a foot in the door, a stepping stone on the career path to a "real" game development position. But others have a much more dismal view of game testing, envisioning it as little more than a room full of button-mashing monkeys. Even so, people continue to flock toward the game testing labs at Nintendo of America (NOA) and Microsoft Game Studios (MGS), eager to live their own small part of the game development dream. 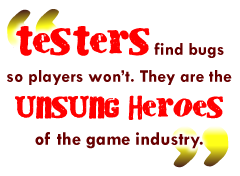 Whether they're climbing the development ladder or just there for the paycheck, however, they serve a vital role: Testers find bugs so players won't. They are the unsung heroes of the game industry. Most gamers are probably familiar with the open-beta model of testing, where eager consumers get to download a pre-release build of an upcoming game and test its multiplayer capabilities. It's as much a marketing exercise as a development tool, a chance for fans to preview an upcoming game in return for providing some feedback. Unfortunately, professional game testers rarely have the luxury of choosing what they test. Contractors at Nintendo and Microsoft are typically assigned to whatever titles are in the company's test queue, and those assignments aren't always interesting for everyone. After all, not all gamers enjoy the same types of games, and action game fans may find themselves testing a strategy game instead. Even if you get to work on a game you enjoy, it can be tiring to play the same thing day after day for months on end. Test managers sometimes try to mix things up for variety, but the process of testing a game takes a long time. As a result, fatigue is a very real problem that even unlimited amounts of free coffee can't solve. Testers nod off more frequently than might be expected in a tightly monitored environment. This is especially an issue for younger testers, who may be burning the candle at both ends trying to juggle an active social life with the rigors of a full-time job. There are also some unusual side-effects that come from playing the same game for months. One quirk is that it's almost impossible to play a game for that long without becoming exceedingly good at it. This can lead to awkward social situations once the game is released, with testers unable to play on equal footing with their friends. Likewise, some testers are simply no longer interested in playing games they've tested for fun. Galen Davis, formerly a tester at Nintendo for over a year, still hasn't turned on his Wii since quitting his job three months ago. After spending thousands of hours in front of a Wii at work, his Xbox 360 is a much more refreshing entertainment option. Surprisingly, there can also be health-related side-effects of being a tester. In a cramped work environment, germs and sickness are a problem. There is disinfectant available, but players don't always use it when swapping controllers or equipment. In addition, because testing is a low-paying position, some testers who are strapped for cash may show up for work even if they're not feeling well. Davis' wife remembers him coming home sick a lot. Playing games may be good for your mental and physical health, but testing them can certainly exact a heavy toll.